Another oddity regarding the model neighborhood in the mid-to-late 90's and early 00's. The triangular part on the top of Brockett's Bakery (the yellow building) moved quite a bit, and I often wondered why. 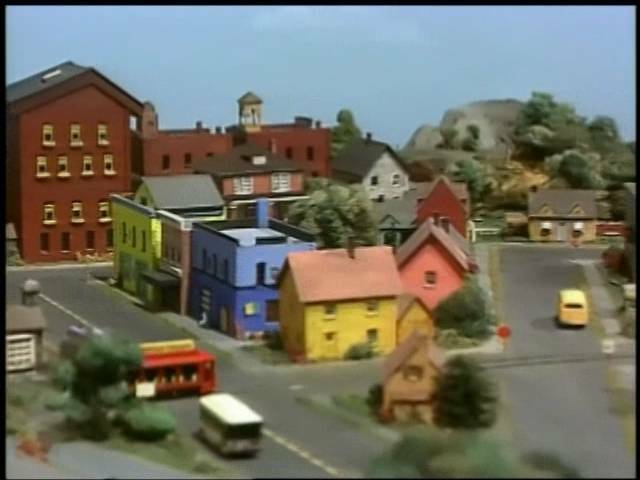 Just thought I'd point it out -- something that's always boggled my mind is the constant changing of the model neighborhood during the later years of the series! That is awesome! Let's see if we can notice other intricate changes over the years like that that aren't very obvious. Even Bob Trow's workshop (the peach-orange ish building) got flipped the other way for one or two weeks in the late 90's. ... can you tell I've studied the model over the years? It was one of the things I was VERY much fascinated with as a child -- and still, to this day, would LOVE to see in-person. My father even constructed wooden versions of the buildings for me to play with. I can remember being so very much delighted when Fred walked over the the model at the end of that "Superheroes" episode! Agreed. This has never made sense to me either. Interesting post! I never paid attention to the roof before. One comment, in your screen shots you've validated the idea that the brown "office" building looks different in the 1990s. Maybe it's the camera angle, or maybe the set designers repositioned it on an angle, but over all, it looks wider to me. Anyone else see that change? Nothing changed there -- just a different camera angle. As a matter of fact, darn near ALL the buildings from the modern era (and technically back to 1974) were constructed from kits that are still readily available. That famous red brick "NET" building? That's simply two of these (click link below) on top of each other with a custom slanted roof! Look at it closely -- you'll even see where they stacked them on one another. Obviously the picture shows the building the way the kit instructs you, but look at the windows -- you'll see it... and, by the way, this same kit was used for the two brick buildings back and to the RIGHT of the red "NET" building ... and was also used for Brockett's Bakery and Betty's Little Theatre. And also the blue/gray building to the RIGHT of Mister Rogers' television house. One of these days you'll see how all the models came from kits -- and how the art department got pretty creative with them! That info will be coming soon! Thanks for all the information. I was talking about the NET house...not the house to the left. Must just be a different camera angle. Looking forward to the additional information you want to share! Wow, I've never noticed all these changes! My guess is the reason that yellow gable moves around could be because they changed the building next to it to be a two story, so they experimented with the gable's position to find the best fit. That's just a guess though. I haven't checked other episodes yet, but this is from 1703. I'll have to check and see if there are more episode like this. I vaguely remember this house as the red "one window" version ... but I don't believe it was around long. That "NET building" was one that went through a lot of changes over the years as well. Started as NET building from reverse angle, then color NET building, then brown building, then red building with one window, then red building with more windows. I knew that something looked different with the NET building in the later modern episodes...it was the border on the roof. I also think that maybe the buildings were slightly repositioned, as the NET building does look more slanted in the later episodes. I don't remember the one window red NET building version. I remember the one window "shingle" version (which came right after the actual NET logo building), but not this red version. I would guess that a lot of the episodes used stock footage of the model- several passes of the model that were filmed ahead of time to be used as needed. So they'd film from Fred's house to the bakery, and then back again. However, the model may have only been assembled for a few days each filming season and then dissassembled (or at least partially) to be stored away (soundstage space is valuable). It could be that that moving roof on Brockett's bakery was accidentally knocked loose at some point, or was never even fastened on, and through the years, with new footage being filmed, it's placement changed. Then when stock footage was being assembled into an episode, footage with 2 different arrangements were used without anyone noticing. I have to say I never payed much attention to this model. I loved the Neighborhood of Make Believe models but the real world stuff never interested me, with the possible exception of Fred's house.